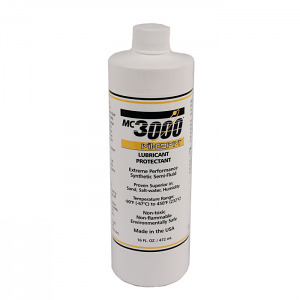 MC3000® Firearm Lubricant/Protectant is Mil-Comm Products' blended, intermediate viscosity lubricant developed for applications that require characteristics between those of TW25B® grease and MC3000® oil. Developed specifically for use in the U.S. Navy and Air Force F-15, F-16, and FA-18 20mm gatling guns, however is perfect for long term preservation of any firearm in all climates and conditions. 16 oz bottle.